In a way, Kriya yoga is like music; it is not enough to have an instrument in your hand, you must also wish to play – and when you have learnt to play, the art is to play so well that it satisfies yourself and others – you may later become a master. The two first conditions are made possible during the initiation, the last with use. Kriya means process, a process that primarily cleanses and strengthens – creating lightness of body and clarity of mind. This is the base, from here you go on. Dedicated to Paramhansa Satyananda – see the illus. (1968) – and to those who wish to live up to the teaching he gave us personally in his tantric meditation period in the 1960’s and the early 1970’s. In order for the student to be able to use Kriya Yoga independently after the initiation, first the teacher must be able to lead him or her through another form of experience than that of “just” instructing a few methods. During the initiation, the student is not left alone, neither with soaring expectations nor with ideas of what is, or is not, possible. The initiation must ensure that you experience the methods in the most profound manner – and that you can utilize those kriyas that give strength and openness, to tackle what you meet on the way. To become one with yourself, and to be able to communicate with others from your self; this is an important result of an initiation. The course must be arranged and must proceed in such a way that guide and aspirant can travel together through states and dimensions, meet and come to terms with inhibitions, fear and frustration and achieve insight and knowledge. Then, you can progress with what we call spiritual “development”. Actually, this is not really development, rather an insight about or a discovery of dormant possibilities, which already exist and which are awakened and made conscious during the process – a transformation of the state you already know into something deeper and greater. So the aim is not to create a superficial euphoric excitement or to get a hasty technical knowledge of a few exercises, it is to have time to reach the essence of life itself. “…yoga means, not this realization, but the means by which it is attained. Yoga is thus a term for those physical and psychical processes, which are used to discover man’s inner essence, which is the Supreme. Kriya Yoga is not taught from a book. Kriya Yoga is not learnt from a book. Kriya Yoga is passed on in an exact and at the same time artistic way, side by side with other methods that help to keep the mind open and the process going. “If you want success, use Kriya Yoga”, I once heard Paramahansa Satyananda say. It is true that an important part of Kriya Yoga is the depth you achieve, but if you do not take initiatives and lead an active life, you will have no idea of what to do with the increased energy and inspiration, which you also get from this practice. Why an initiation, couldn’t you just…? The first impulse to write about the demands that must be made on the teaching of Kriya Yoga I got in 1990, on my first trip to Australia and New Zealand. There, I met people who had learnt Kriya Yoga in a way not consistent with what I had learnt, used, and experienced as a teacher. These people had had effects which were not the ones intended and some had lost the desire to use what they had learnt; therefore, they came on my course with questions which made me examine what had happened. There had been no mention of a real initiation. It had been a question of technical instructions within a superficial teaching with no check made to see if even the most fundamental kriyas had been properly carried out. Further, the learning of the kriyas had been split up into several courses, so that the students came home after the first course with an incomplete picture of the process. Several people had not finished the course. The students had been given no knowledge of the individual kriyas and their function relative to the larger context. Nor had they experienced using the programme of kriyas on their own. It must have been like reading notes to a composition in several sessions, without knowing how to play the music and without being able to experience the whole. In different places in Europe, also, people have asked me what to do with various experiences, or told me that, considering what they had learnt, they hadn’t got what they expected. This could of course be due to high expectations. However, I allow myself to doubt this. The effect of Kriya Yoga cannot be mistaken, if learnt properly. It could, therefore, depend on the teacher not having the necessary knowledge about this dynamic meditation, and not having taught it on the basis of personal use and experience. Or the person concerned hasn’t had the time or the courage to give the students the possibility to go through a thorough and deep-going process – the teaching has not taken place under the right circumstances. Here, of course, I am referring to the advanced Tantric Kriya Yoga, which contains more than twenty effective kriyas. Before the initiation itself, the student should be prepared body and mind, with a warm–up that lasts at least a week (on a one-month retreat) and this is on the condition that the student has participated on retreats before and learnt to use the preparatory exercises at home. On a three month Sadhana retreat, the warm–up lasts five weeks. When the initiation has commenced, it is vital that you have time to deal with everything that happens along the way. Together with the student, the teacher must be able to live through a process, where experiences and energy are used in such a way that you really experience the essence of Kriya Yoga. By going all the way, with a carefully planned process, no “subconscious eruptions” (in the words of Swami Satyananda) will occur later on, when the student uses the meditation at home. Having said this, I must add that, to a great extent, it naturally depends on you – both when you prepare yourself before the initiation, during the experience of the actual process and later when using Kriya Yoga on your own. “During this course, you have taught me to appreciate Kriya Yoga more and more as a ritual. That is, I have started to understand the benefit of constantly interrupting my present state, with a bend of the head or by shifting position between two kriyas, or whatever else we do during the process. I trust, or rather I feel strongly that the geniuses who invented Kriya Yoga, have known how to trigger my mind in the right way. The best I can do is to take it easy and follow the method, and experience the kriya I am doing, before I go on to the next. “Oh Swamiji, I saw all these wonderful colours”, said June Jackson (psychologist from Australia) on a course in India in 1973. In the last few decades, the concept of Kriya Yoga, to denote that meditation practice which Swami Yogananda introduced in the west and Swami Satyananda, in the late 1960’s, showed us in its full potency, has been devalued. 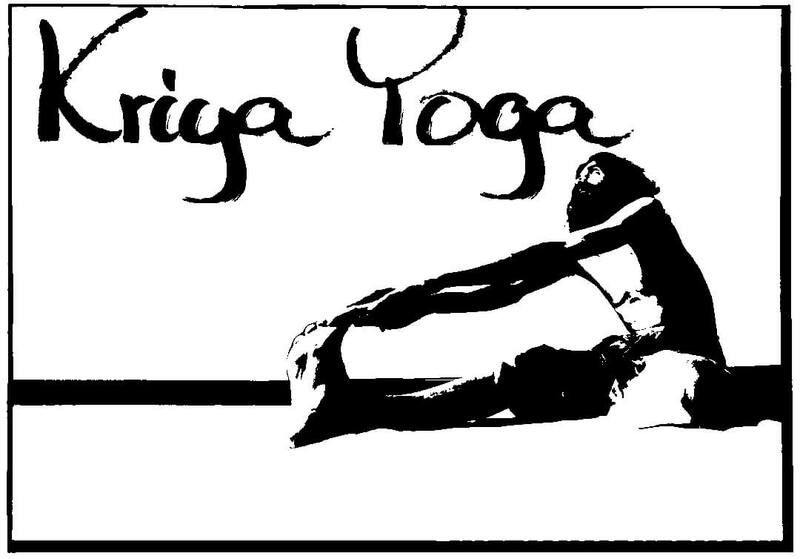 I wrote my first article about Kriya Yoga in Bindu 1994. At the time, little mention was made of it and not much teaching was going on elsewhere. I had then been teaching advanced Kriya Yoga for twenty three years. Shortly thereafter, the word became fashionable, and you heard Kriya Yoga talked about everywhere. People who didn’t know about the original Kriya Yoga got the idea to call other sorts of yoga Kriya Yoga. All of a sudden, you could learn Kriya Yoga over a weekend. The advanced Tantric Kriya Yoga should not be mistaken for the “kriya yoga” that you can learn over a weekend or in a week, nor with the physical cleansing processes Hatha Yoga Kriya or Shat Karma, which are a part of the preparations for the initiation. In “Yoga Sutra”, you can also read about Kriya Yoga, but there, it is about something completely different, namely the attitudes and disciplines in Raja Yoga, which Patanjali represents, not at all about the meditations and practises, which the Tantric Kriya Yoga consists of. 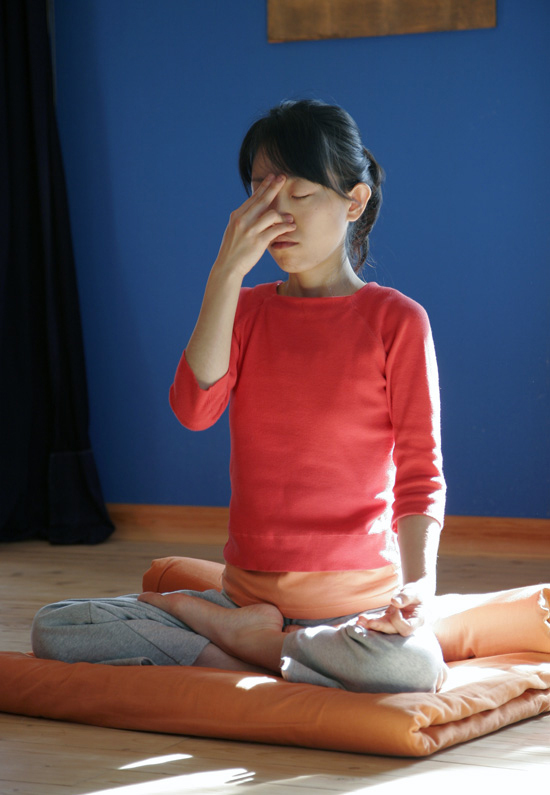 Beginners Kriya Yoga consists of five small kriyas. In our school, we call this variation Source of Energy. Originally, it was called the little Ajapa Japa or Vishuddhi Shuddhi. Vishuddhi Shuddhi means “that which cleanses Vishuddhi Chakra“, the throat chakra or the purification chakra, but it doesn’t only include Vishuddhi. The psychic cleansing referred to here is part of the preparations necessary to learn the actual Kriya Yoga. We teach this beginner method both at our city schools and on weekend retreats. On our longer retreats at Håå International Retreat Center in Sweden, it is taught as a preparation for the Ajapa Japa, see below. A complete instruction of this method is found in my book, Yoga, Tantra and Meditation in Daily Life, chapter 11 page 114-115. Intermediate Kriya Yoga consists of nine kriyas and is called Ajapa Japa in our tradition. This is taught on our 10- and 14-day retreats. The name Ajapa Japa was originally used for the fifth step in Japa– or Mantra-Yoga. It described a spontaneous repetition or experience of the mantra. 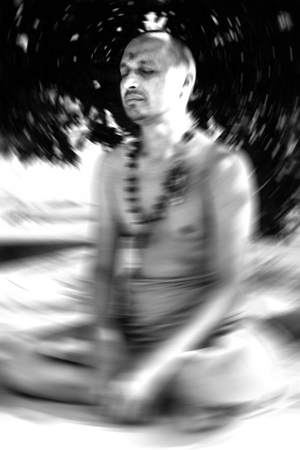 Later, the name Ajapa Japa came to describe a simple meditation where you synchronise breath and mantra. Ajapa Japa, in relation to the Tantric Kriya Yoga, is a meditation consisting of nine different kriyas or processes, among them a special breath, a mantra and the use of the flows of vital energy in relation to the chakras or psychic centres of the body. in the center of your spinal column. Ajapa Japa is a necessary part of the preparations for Kriya Yoga. Swami Yogananda often gave just parts of this meditation to his students in America. One of the basic components of these meditations is the psychic breath. It has many names: Ujjayi Pranayama, Kriya Kundalini Pranayama or the breath of the psychic heat. Straining, faulty sound or none at all, or no pauses after the in- or out breath, can give incorrect and unintentional results, similar to, for instance, hyperventilation. It is, therefore, important that the teacher knows this breath from his or her own practise and can instruct and correct the student with confidence. I, unfortunately, have heard of one incident in India where an Australian woman was to instruct this breath to a group of people. It was done in such a gross and superficial way that one doubts whether the instructor had personal knowledge of this wonderful instrument. We received a student from the above-mentioned course in India at Håå Retreat Center. When we checked his psychic breath we didn’t recognise it – he didn’t really know, either, what it was supposed to be good for. When the psychic breath is performed in the correct manner, it strengthens the energy field of the body and gives rise to a stable meditative state. It can also normalise the blood pressure and remove depression. Until a few generations ago, Kriya Yoga was a practice only for Swamis, “it was our practice”, Swamiji said to me one day. It was not revealed to others. In our time, Swami Yogananda and Swami Satyananda, among others, have decided to pass it on and train a few swamis to teach it. So, apart from this background, what can you expect of a teacher? Well, apart from purely artistic abilities and the thoroughness of a craftsman, my view is that you cannot teach this unless you have personally sought the deep and the profound through this Tantric meditation. The person who has not sought this yoga, and really used it – no matter how great an authority he or she may have in the eyes of the world, or in the eyes of the students – knows nothing about it. Ignorance gives rise to preconceptions, and that in turn gives rise to fear – fear of the unknown. Fear limits the way yoga is taught and stops people discovering this spiritual gold. As a teacher, one must have learnt this directly from ones teacher, then have independently delved into it, have a full time training of many years and a long experience as a yoga and meditation teacher. No matter how well an ever so secret process is described by one who has learnt the description by heart, but who doesn’t know the effect of the deeper processes on him- or herself, it can never be fully revealed. Even if written down in the smallest detail, or taught on the basis of something learned by heart – without the initiation, being directly guided, as an unbroken sequence where all conditions, preparations and the attitude of the participants are correct – you cannot speak of an initiation into Kriya Yoga. Before the actual initiation even begins, with all that it entails, those who wish to participate have to be prepared at the place of the initiation. This means going through an intestinal cleansing, unwinding, getting used to participating in the training and deepening one’s meditation. When the initiation is underway, various other meditation methods, yoga exercises, dance and music etc. support the sequence, keeping the body supple and the mind open. It must all continue undisturbed by outer influences and distractions – “under ashram conditions” according to Swami Satyananda. The aspirants are living where this is taking place, and do not leave during the whole process. Also, the people working behind the course with cooking, administration or as assistant teachers, must have personal knowledge about and experience of Kriya Yoga – so that they know what is going on in the meditation hall and during the process as a whole. This is not just a question of a giver and a receiver, but one of interplay between everyone participating in the process as a whole. For the participant, it is important not to let the desire to “understand” – like a good little schoolboy or schoolgirl – block the ability to experience. He or she must, in other words, be prepared to participate wholeheartedly and with commitment. says the Danish actor Ove Sprogø about an evening at the theatre. This seems to be a law of nature, which applies to all forms of human expression and interaction. Openness is inspiring and contagious. Also, the teacher must be prepared to give himself/herself, to be a medium who, with body and mind, meets and overcomes hindrances and, to a certain extent, shares experiences with the students. Therefore, the teacher is vulnerable. Like a snail retracting its feelers at the slightest touch, or a mimosa quickly closing its blossom – it doesn’t take much to kill the creativity needed to make apparent the secrets of meditation. Just a little distrust, insensitivity or indifference, expressed through misunderstanding or lack of awareness, can be enough. To be sure, many a genuine teacher has stopped teaching the real yoga methods prematurely – others haven’t dared step out of the sheltering role of guru and enter into the fellowship of the process, which is needed for an initiation to happen. Yet the Tantric rituals are full of power and strength, which both guide and aspirant benefit from. With an effective method of meditation and good guidance, measurements have shown that the brain frequency of those already in a relaxed state influences the rest of the group so that they can reach the same state more easily. What is the purpose of a ritual? Is it to revive or reinstate a system of belief with outer signs and gestures? Is it done to hold on to a power structure or ensure a hereditary authority? Is it to work people up to euphoric states or personality worship, so the participants can surrender their independence and responsibility? No! It is a process where you remain in contact with or rediscover your innermost nature, your creativity and source of energy and fulfilment. Maybe you wish to overcome what stops you from living in accordance with your innermost sense of purpose. The ritual is there in order to light the light of consciousness over and over again, so that it can burn high above the theorising and know-all attitude of the limited mind, and offer you the possibility to experience. To make the light flow and let the purifying flame of Sushumna burn clearly – what else could be the purpose? A process, a ritual or a cycle, created by a composition of certain yoga- and meditation methods, must follow definite laws in just the same way as composed music. The methods work together and strengthen and deepen each other’s effects. It doesn’t matter whether music is based on notes written down or on improvisation, you have to get in touch with its essence. That is the basis – but it is the musicians’ ability to communicate and the openness of the participants, which makes the music come alive and turns it into an enriching experience. If you leave the concert, you hear no music, and if one or more of the spectators were to demand, on grounds of principle or for any other reason, that something else should be played or that it should be played differently, or with another beginning, because they already know some of the opening stanzas, or because they want what they’re used to, or that they would like to relate to the piece of music in a theoretical way instead of listening – then it would be impossible to get the creating and experiencing process going. Then the whole thing would die in a repetitive and mechanical performance. Everything would be left to chance, instead of taken along a path towards a result – to a heightened experience, or spoken in terms of yoga: a stable altered state of consciousness. Like much music, the sequence of the various kriyas has a certain regularity and a certain order: beginning, intermediate parts, climax and release. The initiation into the advanced Kriya Yoga should not be broken up into fragments, any more than a piece of music. Then the basic experience of the whole would be lost – and the beneficial and reciprocal effect the kriyas have on each other when performed together would be lost. 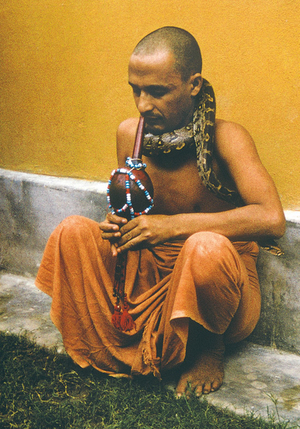 Swami Satyananda under the big mango tree in the ashram garden, 1969. “Don’t leave them alone”, Swami Satyananda said to me one day, when we were talking about teaching. What he was expressing wasn’t just that I should give my students thorough instructions in the method. During the learning process a training takes place, where the teacher “disturbs” the students when they forget themselves. This brings them back to the meditation. When the training is over, it is the method itself that holds your attention or makes you return when you’re about to lose yourself in other things. What I am speaking of here is a principle in Tantra. The mind must be engaged all the time by that which has an effect. The method should be so comprehensive that it cannot possibly be done automatically – in this way, the stream of thoughts are broken without effort. This occurs in all Tantric rituals, both the sexual and the more advanced ones like Kriya Yoga. In certain Zen monasteries, one of the monks goes behind the others while they are meditating. When one of the participants changes position and leans slightly forward, it is a sign that he is lost in thoughts. The person is politely contacted, and then receives a good smack over the shoulders with a flat stick. It then takes a while before he forgets himself in thoughts again. A basic part of the training are the meditations Inner Silence (Antar Mauna) – which is practised in a sequence of seven steps – and the meditation Returning. They are essential when learning Kriya Yoga. They are also part of the warm-up just before and during the initiation. A daily guidance or practice of Inner Silence or Returning gives you, among other things, an ability not to be carried away by all that flows through the mind in the form of thoughts, moods, emotions and states. These meditations help you not to forget yourself. They strengthen the ability to live a tolerant and independent life in relation to the conceptions, fantasies and ideas that might cross your path. The various other daily routines, karma yoga, yes even jokes and teasing, can, to a very high degree, help to liberate a person from years of neuroses and frustrations. During the meditation, it may happen that you forget yourself in daydreams or worries – maybe you react or sit and think enthusiastically about what you are doing – instead of doing it. Then an innocent question from the teacher during the guidance helps you return to the practice, to the experience of what’s happening. Many have a “guru” at a distance, who they meet on festive occasions, or who they don’t meet at all, just dream about, but this has nothing to do with a direct guidance in daily training. Of course, one can imagine anything; often people sit at home with their “yoga” and become “learned” and oversensitive on the basis of their books and dreams. Or they go the other way and become very physical, thinking that exaggerated gymnastics and suppleness is the only solution, even though it makes no difference. An introvert, self-obsessed or conceited stance probably constitutes one of the most difficult hindrances to achieve an open state, an expanded awareness and a sensitive and respectful attitude to yourself and life. This is why we use the Tantric techniques. Do you know, or are you guessing? When you express an opinion or a judgement over others. When you interpret what other people say, your teacher for instance. Do you know it, or are you guessing? In Patanjali’s Yoga Sutras, various hindrances for self-realisation are mentioned. One of them is misunderstanding. If the students quickly interpret the instructions of the teacher after their own thinking, so as to avoid giving up ingrained ideas, does not give any insight, but stops you from taking in something useful. One time period consists of six intervals (hou). In two intervals one gathers Moni. You are warned from entering the cave of fantasy. Instead, you should stay in the space of energy and let energy and breath unite in the area of the elixir Amrit, nectar, ambrosia… this is the right space. During the meditation, the meditator should possess a kind of conscious intuition, so he or she can feel energy and breath uniting in the sphere of nectar – a warm release belonging to the true light, light as a mist, is beginning to stir. “What is here is elsewhere. So what do you prefer: To dream of all the possibilities of existence, or to live in accordance with your energy and your breath? If your actions result from this, you don’t need any fantasies. You will be able to see what life really has to offer! The inner experience is intensified during the learning of Kriya Yoga – this can give vivid memories, insights and “aha-experiences”, but it can also make you aware of moods and states, which before, have been more or less subconscious. Beside the actual Kriya Yoga, many other ingredients play a part in the process. A particular method or meditation is applied just when it is needed, to catch and release a state, to inspire through experience – and to lead the process in the desired direction. It’s the whole context that helps keep the concentration on track and maintain awareness. Therefore we proceed, alongside learning the Kriya Yoga, with physical exercises (asana) and breathing exercises. This further ensures that the flows of energy are kept pure, thus counteracting blockages, both physical, mental and psychic.Meditative song and dance one or two evenings a week are not just a break in the routines, they also help keep the process going and the mind open and receptive. During the dance, you become part of a group in a positive sense, not left alone with fantasies and worries, and you train the ability to let go. In a canoe, if you are inattentive and wrapped up in yourself you may capsize, so you can’t forget yourself there either. Even going for a horse ride can play a part. It’s pretty difficult to be introvert when you are sitting on another being or taking care of it. The horse wishes, or rather demands your attention, that you are present and give contact while riding and being together with it. If you are not, you will certainly be made aware of it. If you treat a living being mechanically or as something insensitive, you belittle it, and what joy does that give either of you? Besides, this applies also to the people around you. It is good, both for them and for you, if you dare give proper contact – and don’t just talk yourself out of it. In the sheltered milieu of the ashram, unnecessary stimulation of the nervous system doesn’t excite the mind. During the initiation, the diet, after the intestinal cleansing and on the rest of course, means that you don’t take any stimulants – neither black tea, coffee, chocolate, alcohol nor stronger substances, such as for instance narcotics or anti-depressants. All these are prohibited to keep the state during the initiation sensitive, clear and stable, and to make the nervous system strong and independent of stimulants. Strong spices are not part of the diet either. When the sensitivity increases, there is a risk that they bind energy in the intestines and stomach area, thereby influencing the mood and the psychic state. So the food neither irritates the nervous system nor the stomach. Living on other people’s fantasies by habitually consuming news and entertainment in the media, can limit your drive and independence, and this creates fear. When looking at the TV-screen, you do not experience that you are in charge of your own life, and you lose the ability to remain yourself. Instead of identifying with the worries of the media, during the retreat you can take a break from all this to be together with yourself and other “real” people. I can compare a stay at Haa Retreat Center with a stay in the “pyramid”. You rest your senses. A tank, 2,40 x 2,40 m, is built into such a pyramid. It is filled with about one foot of salt water that makes your body float. The pyramid is isolated from sound, and when the door is closed, it is dark. The salt water has the body’s surface temperature, and the air is silently renewed. So, you are not being exposed to any influences or variations of temperature or air, and the salt water, to a certain degree, makes you feel weightless. When you float in the pyramid for about an hour, completely still with no outer influences, the mind calms down. When the senses are permitted to rest, no new thoughts are created – and the ones already in the mind are thought through. This corresponds with the yoga method called pratyahara, which is used in the relaxation Yoga Nidra and in part of Inner Silence. Afterwards, you find yourself in a state of peace and clarity. The effect of a sadhana course or retreat in an ashram therefore has an effect similar to the one you get in the pyramid. Without any influence from the restless entertainment of the media, computers, mobiles and the environment at home, you not only give the mind, but the whole organism such a holiday that you achieve the peace needed to go through the initiation and training you have come for. The mind can now digest and free itself of old patterns, and this deepens the learning. That’s why the learning of advanced Kriya Yoga must take place under conditions such as we have created at Haa. If you were to teach Kriya Yoga in a town, you would, for example, have no guarantee that people would really use the complementary yoga programmes and the Inner Silence meditation. Together, these keep the body and mind free from blockages, till the Kriya Yoga starts to work. The state during the initiation must be balanced, pure and subtle, both mentally and physically. This is achieved through the diet and the conditions, where you are not tempted to consume anything else than the diet. In a town, you are exposed to all sorts of different stimuli and influences. There are examples of such teaching in cities in Europe. I have learned that this has given bad and unwanted results. The ritual is not an escape from something, but a search for the primordial, re-establishing the contact with the inner source, the spontaneous and the ability to be. …when Tao is lost, there is power. When charity is lost, there is justice. When justice is lost, there is formalism. Tantra starts from the healthy and original. Too much thinking, on this Earth, originates from an idea of the human being unhealthy, and from the idea of suffering and miserable humanity. This applies to medical care, where patients are often held in a subordinate and dependent role, which demands the care. They have no say against the doctors’ omnipotence about their state, and they are not taught to participate actively in the healing process. Within psychoanalysis, different forms of “healing”, art, philosophy, religion; yes, even within some schools of yoga, the human being is seen as fundamentally suffering. In this way, a false identity is created and we hold on to it, a warped picture of our true nature. When we are to be healed, the work is, therefore, the same as in politics when you have a faulty body of laws, which you keep patching up – a law system, which claims that all people are criminals until proven otherwise. Man’s innermost essence is healthy, strong, sound and radiant. Such a perception of ourselves must be the basis of all help we give each other or each individual gives him/herself. Now and then, when we forget ourselves and hold on to a false identity, then we only need to realise our true nature to be able to move on – even though sometimes this is easier said than done. True initiation (and the healing that often follows as a side effect), gives you an experience, where you see yourself as you really are – you return to yourself. This is where the teacher must be able to take you through the crisis that follows from letting go of false and self-effacing concepts – and through experience and insight, show you that states are not everlasting and all-important. You learn how to avoid losing yourself in what you are not. The methods of Tantra and the knowledge you receive can be used to bring forth the person in you that goes to meet life and that is strong enough to be true to his/her own nature. I discovered what it is to be alive by being it, not by living on dreams and ideals. The methods helped me, and I removed all manner of excuses and fear that I had built up around me, hindrances standing in the way of me being the one I really am – and thus being something for others. There are Tantric rituals that, taken in all, can last a whole day and night, yes, even longer. The sexual rituals are most widely known. Kriya Yoga has a structure, which can be compared with the sequence and arrangement of the sexual rituals, but it is deeper reaching with a long-lasting effect. The Kriya Yoga ritual demands it’s preparation, it’s warming-up, and during the actual process, it’s various kriyas – some ensure a harmonious process, others fine tune the mind or purify the energy and strengthen the awareness. It all finally culminates in the deep kriyas, the finest of meditations. During the last half of the 1960’s when Paramhansa Satyananda was teaching the great Tantric Kriya Yoga himself, the whole thing was accomplished as one long initiation. The result was that we learnt a Tantric ritual consisting of more than twenty kriyas. The secret of learning and practising the kriyas in this way is more than just the learning of a few exercises; it is transforming and energy-giving. We moved through all our dimensions, from the physical, via the mental, emotional, the energy dimension (with flows of prana or life energy), the psychic (including the chakras), the astral and the causal, to pure consciousness. It can’t be done in a shorter time! Longer, certainly. The longer time there is to learn the Kriya Yoga, the deeper you can go, the more you can discover about yourself and the possibilities to be found in Kriya Yoga; and the greater the inner purification. On the annual Three-Month Sadhana Retreat the actual Kriya Yoga initiation lasts at least 33 days. It takes place after a five-week warm-up and preparation, and is followed by three weeks to digest everything – and additionally to deepen and explore other methods, which you, at this point, are open to benefit from. The other Kriya course I teach lasts a month. It therefore requires that at least one course has been completed beforehand – in which the aspirant is prepared with yoga and meditation, the seven steps of Inner Silence and the nine steps of Ajapa Japa, methods that he or she then uses at home during the period before the initiation in Kriya Yoga. Any teacher who doesn’t have the time to pace the course in such a way that things are allowed to fall into place and be experienced in an unbroken sequence of events, and not in several short periods, should, for this reason alone, refrain from teaching Kriya Yoga. A student in New Zealand showed me clearly what happens when somebody teaches Kriya Yoga without having a proper relation to it. That teacher must have had some sort of sequence to start off from, and must have then decided to teach my student the first 10 kriyas on the list. This happened to result in Tadan Kriya finishing the sequence, being last on this arbitrary list. So the student came to me and said that he felt restless or uneasy in the body after finishing this programme. It is obvious to one who knows that you cannot end with Tadan Kriya. Tadan must be followed by kriyas that refine the relatively gross, but desired, effect, and thereafter by meditative kriyas, that integrate and harmonise the increased energy. It is vitally important that the initiation consists of all the kriyas, both the gross, the intermediate and the fine, so that the student is not sent home with an incomplete experience of a sequence, and so that he or she can finish in a harmonious way every time. A process in the Tantric meaning of the word is a cycle with a beginning, a sequence that develops and changes, and a conclusion – it is something you live through. During the initiation, the process should bring the aspirant further than he or she was when it started. If you don’t reach beyond former limitations, it is not an initiation. This, we can understand from the name Kriya, which in this context doesn’t just mean action, that is, a decision carried out in life, but inner dynamics – a process where something happens – a transformation of concepts and states. The Kriya Yoga sequence is such a Tantric process: every meditation method, every kriya which it contains plays a part, and the different kriyas supplement each other – just like everything else happening on the course. Every part of the process prepares for the next and opens the door to go further. In this way, a sensitivity and an ability to go deep is gradually built up, so that you can pick up and use the finer “keys” to the dimensions of your being at the end of the sequence. The process doesn’t only function because of the exercises you do, but also because you are doing something different than usual – free from habits, routines and thought patterns about what is possible and not possible. The very fact that you let go of that which weighs you down and blurs the view, is perhaps the most important thing about the initiation. But nobody can force you. Yes, the process helps you, with all the methods it contains, particularly the kriyas, the experience of the teacher and the attitude of the participants. It is up to you, however, to be open to the possibilities, and use them, which most people succeed in doing. When I was in my twenties, I worked with various types of theatre. Through pantomime, I learnt to have an unceremonious, robust and practical relation to the classical yoga poses (headstand, shoulderstand, plough etc), as artists in the Chinese and Indian traditions have used them. Then I continued to explore both what yoga, and the theatre, could give me. Grotowski and his company were invited to Denmark by Studenterscenen, which I was a part of, and by The Odin Theatre, which is world famous today for its unique performances and its way of training actors. The Italian Iugenio Barba, a former student of Grotowski, founded The Odin Theatre. It is housed in the town of Holstebro in Denmark. The training which we underwent with Grotowski and Cieslak often started with a gentle warm-up, where we followed Cieslak and did all exercises and improvisations in a sequence. He started with both static exercises and dynamic sequences, which we could easily imitate. The whole thing soon developed to increasingly demanding movements and physical expressions. The tempo also escalated, so there was no time to think of your own limitations. Either you joined in, performing more and more fantastic exercises, or stepped aside. None of the participants had any possibility of impeding the sequence for the others, neither by holding back nor by starting to theorise! Those who succeeded – and by this I don’t just mean that we could follow Cieslak in the physical exercises, of which some were yoga exercises, but also stand facing him in strong confrontations with emotions laid bare – had reached genuine, deep and uninhibited expressions, and on the physical plane, for instance the tiger jump – and they were not trained gymnasts or acrobats, they were ordinary actors, directors and other theatre people. That we disregarded our limitations – regardless of how far the individual could follow Cieslak on the course – gave us all an experience of release that I, at least, have benefited from later. The meeting with Grotowski and Cieslak became an initiation, which showed me that you can exceed limits whether they are created by your own or other peoples concepts. In the dancing that is part of the rituals and initiations of indigenous people, we find the same pattern as with Grotowski. Also here, you warm up, first with slow rhythms and movements – then the dance reaches a climax, where you attain a tirelessness and everything goes faster and faster. The body is liberated and takes control so that the mind forgets all wishes of achievement and grace. It is here that the participants experience a state of consciousness, which is necessary to receive the initiation and expand the perception of reality the persons concerned have had so far. (Birgit Åkesson ” The mask of the spring water“, on dance in Africa). Esu confuses, he is our mistakes, but also makes us aware, so that we can let them go. The initiations of the indigenous people take place several times during a lifetime; first the transition from child to youth, then between youth and maturity, and then, in the middle of life, and at the end, towards an ever greater knowledge. Every phase of life needs its introduction and its release from old limitations. Well, yoga and the various Tantric rituals might not deal with tiger jumps, but the purpose is the same – to get you to be yourself – behind all concepts and self-deception, behind all the complexes which bind us to disease and suffering. (Jerzy Grotowski “Towards a Poor Theatre”). In Tantra, you don’t learn to ‘behave’, like so many ‘holy’ yogi’s (excuse the irony) demand from their followers. You must take responsibility for that yourself. But you find your own ability to form your life in an independent and mature way. Kriya Yoga is probably the most thorough of all Tantric processes, but like several of the other advanced rituals, it is obviously not suited to everybody. In the same way, not everyone should teach it – only those who are able and want to live up to the conditions of Kriya Yoga diksha – the initiation of Kriya Yoga. Giving up an involved state is like dying – and being born anew, freer than before. When an Aboriginal boy was to be initiated in Australia, it was with the sure conviction that he was really going to die and be reborn during the ritual. The whole ritual was built up in such a way that those not yet initiated expected nothing else. The whole tribe (the already initiated) played along in this act, to maintain the illusion or the anticipation and therefore the intensity of the experience, which turns out to be an incredibly effective way of imparting knowledge. Initiations into different phases of life can also happen in our culture, in secrecy. It is as if life itself helps us, suddenly we face the possibility to meet the challenges and have the experiences we need, or we get the chance to meet the person or persons who can help us on. Releasing a tension or an involved state is sometimes like walking up a steep hill; you don’t want to, and you think of any other place that you would rather be – but once you get over the top, and start going downhill, you think: was that all? A cycle must be completed, the sequence lived through and the wholeness experienced; the fundamental inhibitions that isolate and obstruct the view are dropped. You have now lived through most of a course. You have gone all the way. You have taken part in the cleansing processes, practised the physical exercises, experienced and learnt the whole cycle of kriyas in the Kriya Yoga, together with the various other meditations and processes, and everything has constituted a whole – an interplay. This totality has given you a stable effect and purification, which is not only physical. When you come home with the result of this purification and hopefully also with some insight, and relate it to daily life, you will experience a difference compared to the state you were in before you came on the course. You sense that what you have now, both effects and tools, are tangible, and you also know that you haven’t been here to get lost in unreal states or dreams about distant ideals, nor have you been here to learn to idolize someone. No, there has not been the possibility for such excuses or mistakes. The conditions, the guidance and the structure of activities, exercises and meditations have made sure of this. Mind you, you were prepared for it and participated actively . You now have an understanding of an initiation – and can see what it would have meant had you not had the possibility of living through a complete process, but stopped halfway. This would be like the Sorcerer’s Apprentice, not having gone the whole way himself, and not being capable of imparting the complete experience to anyone else. Without going through the whole process, we might not be able to uproot the illusions that fascinate and involve us. In that case, there would still be room for mistakes. All the techniques and facilities that you have had at your disposal here on the course, and the conditions that you have followed, for instance those connected with the silence, have made you unable to hypnotise yourselves into something else. Each of you has remained what you are – yourself – at the same time independent and part of the reality we have in common. When we lose our roots and our connection to tradition, both in our own culture and in relation to the methods we use, we fumble in the dark. We become consumers and inventors. We think that we can buy everything, satisfying ourselves by “studying it” out of curiosity and with no commitment. We expect to have things changed or redone, if we don’t understand it or like it. Everything becomes distorted this way. Both the psyche and nature will be destroyed. You can’t do this with life – and definitely not with its deeper sides. The process in the complete cycle of initiation has protected you. It has shown how you can remain in contact with yourself and in balance, no matter what outer conditions you might encounter in the future. This goes for rituals of initiation everywhere on earth, at least those dealing with altered states of consciousness, and this happens especially in indigenous societies and in the original Tantric tradition. You become initiated to be able to live with a greater understanding and awareness in the life-phase that ensues. To be continued in a later edition. This article is the fifth in a series on Kriya Yoga. The pictures are from “Mithila”, an area in Bihar in India, where particularly the women decorate the walls of the houses. The pictures are not superficial ornaments, their origin is the strong primitive source of folk art, where also, in ancient times, the tantric yantras have their origin. 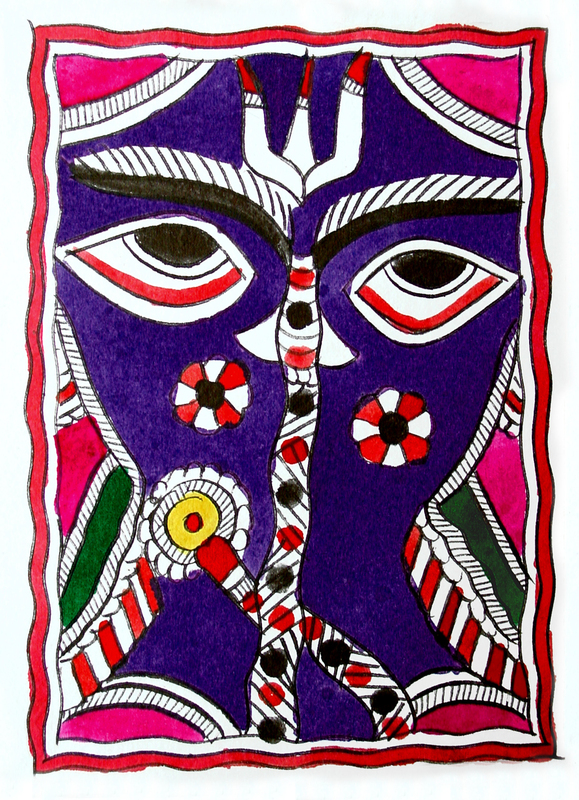 This art is called Madhubani after a village in the area. The drawing the “tiger jump” the painter Sohan Qadri made for this article. 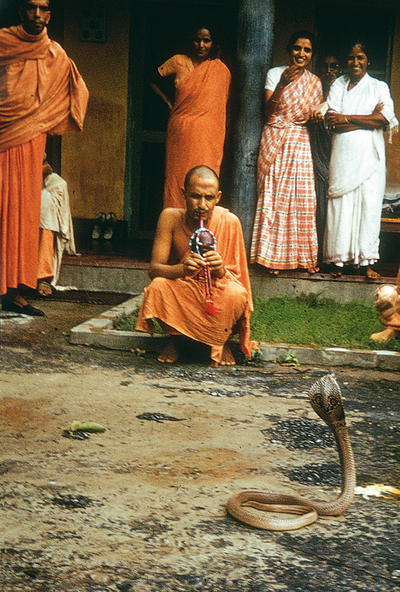 The photos of Swami Satyananda in 1968 and 9 was shot by Swami Janakananda. The photos from the The Three Month Sadhana Course i 2007 was shot by Turiya. The aboriginal painting is done by Joanne Nangala.